I’m addicted to my scrappy project–Louisa Enright’s Scrappy Project–and have been for the past two years. I’m determined to use my stash and to get it into some sort of useable condition. As part of my addiction to scrappy quilting, I had started saving Bonnie Hunter’s columns in Quiltmaker magazine. 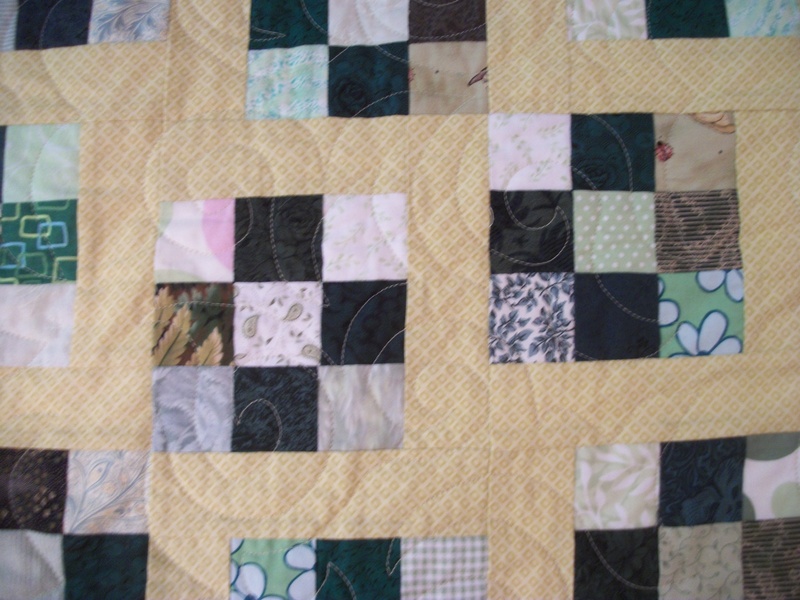 One of my earlier quilts–Spinner–pictured on this blog I’m sure–came from one of Bonnie’s columns. Then our state quilt guild hosted two workshops by Bonnie Hunter–and that coincided with my getting her book on “leaders and enders”–and then getting ALL the books (she’s a genius with scrappy quilt design)–then finding her blog (quiltville.com), all her free patterns (more genius), her Facebook page, and QuiltCam, where she sews and talks to those who have put aside the time to sew and visit with her. That led to the quilt “Green Camden Hills Beauty”–a green version of her “Blue Ridge Beauty”–which is in one of the books and which I also found in my “ideas” file when I cleaned it out recently. On several QuiltCams this spring, Bonnie worked on two quilts for two family babies that she called “Dancing Nines” because the nine-patch blocks are offset so they “dance.” She used old shirting materials from these babies grandfathers’ old shirts. I had a whole bunch of “leader/ender” four-patch green blocks from working with my green stash–so they were easy to make into nine-patches. 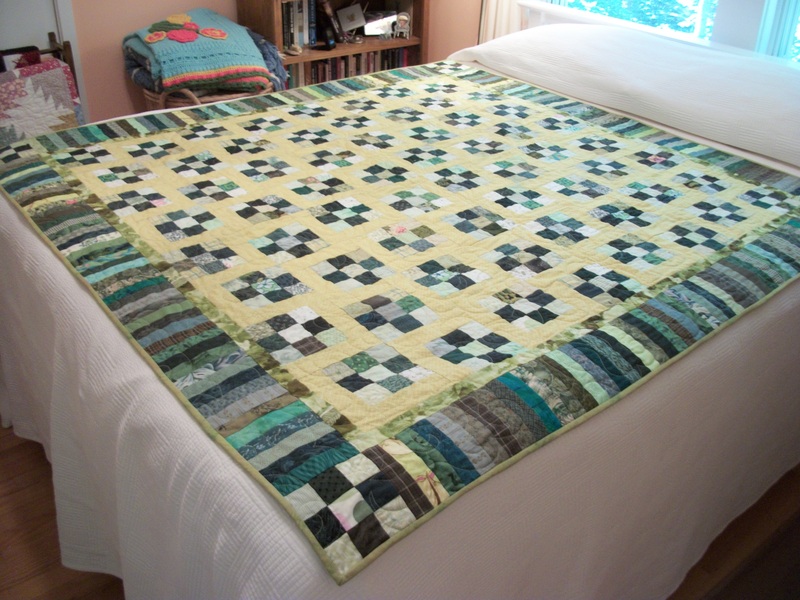 And, here’s “Sunshine and Shadows”–a Bonnie Hunter “Dancing Nine” quilt. 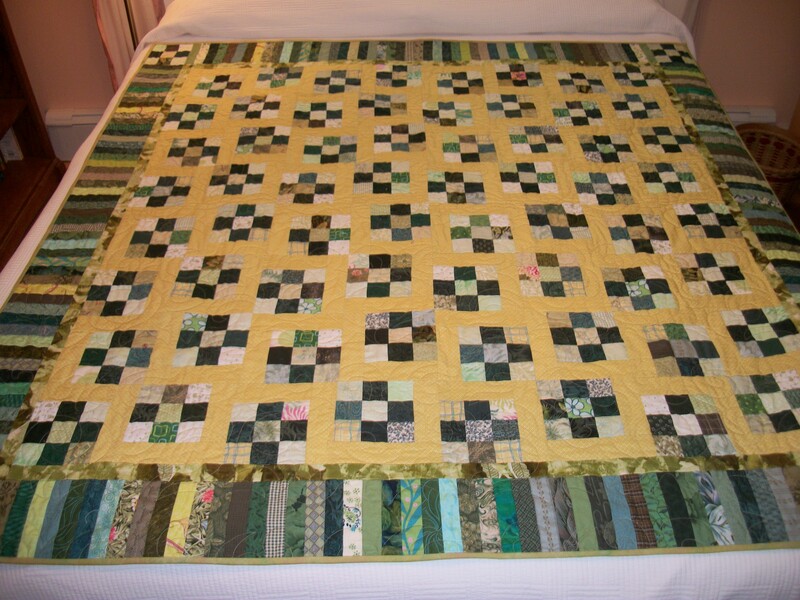 Note that the sashing fabric is NOT yellow, but a green/yellow that blends beautifully with the blocks. I love the piano key border. And it’s a bit different in size than Bonnie’s since I was using strips that I had already cut. 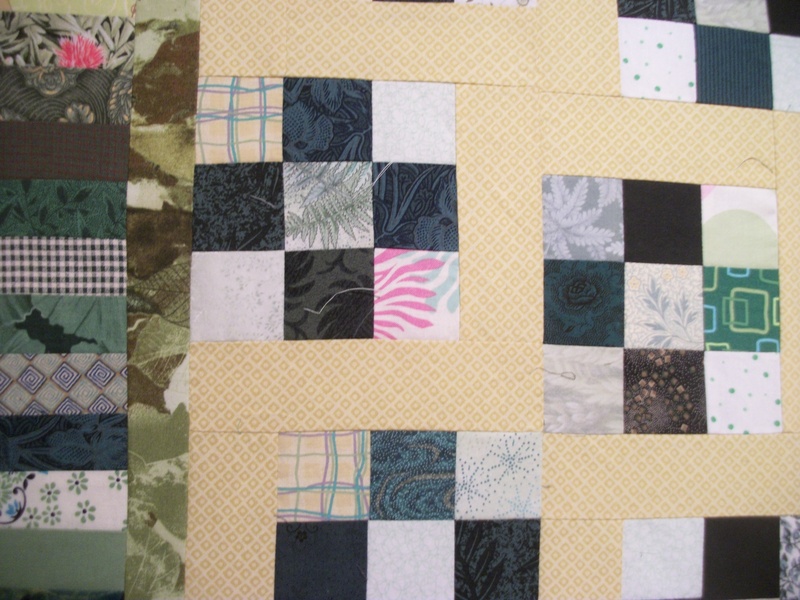 The narrow inner border also works best with this quilt. I had this perfect fabric in my stash, but it was TERRIBLE in a wider version. I should have trusted Bonnie’s eye to begin with. 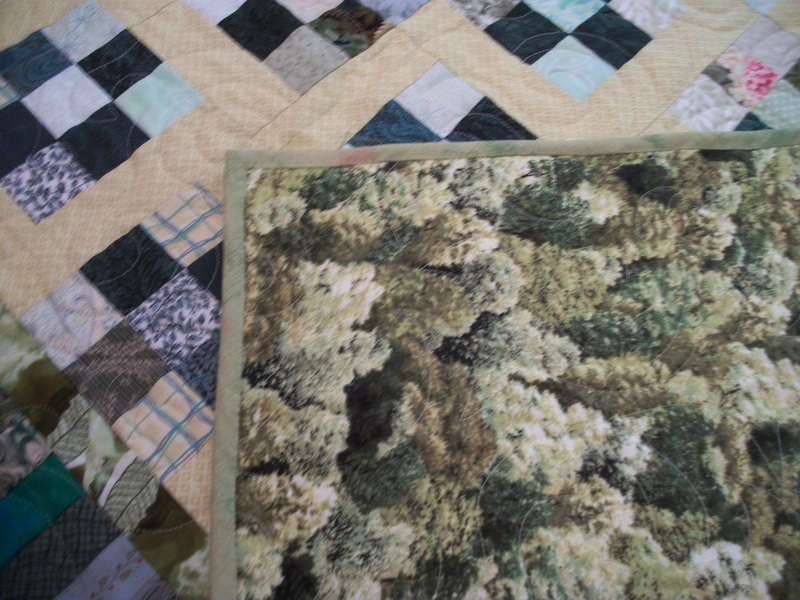 And one of the binding and backing–the backing is like our forests in spring–all greens and yellow and golds. It works really well with the front. This quilt is so versatile. It’s a great scrappy project with a lot of visual interest. It can be made large or small, bright, dull, contemporary, sweet, bold, whimsical, and on and on. I know I’ll be making it again. Best of all, the only thing I had to buy for this quilt was the backing. And I could have pieced a back, but since the quilt was smaller, and meant for a baby I know, I thought one piece of fabric would be best. Amazing you did that from scraps! when it was finished so gave it away. was to ask you about the pattern. I’m surprised to see it was dancing nine patch. Louisa yours look more pleasing and way nicer than Ms. Hunters. May I ask what did you do that was different?